Regina Reid (Gigi) is a healthy hair care specialist from Atlantic City, New Jersey. As a child, both of her parents struggled with drug addiction which resulted in Gigi, and her two sisters, being placed in the care of her Aunt. As a little girl, Gigi took interest in styling hair. She would get in trouble for trying to restyle her sister’s hair while everyone was asleep. In 8th grade, Gigi stayed up all night box braiding her own hair because her Aunt could not afford to send her to the salon. Gigi’s classmates saw her box braids and asked her to do their hair. Gigi continued to style her classmates’ hair throughout high school. Although Gigi was a natural at styling hair, initially, she did not want to pursue a career as a cosmetologist. Gigi enrolled at the local community college to pursue a career in nursing after graduating from high school. After completing only two semesters, Gigi decided that college was not for her and enrolled in beauty school. Jaslynn Ragland (Jas) was born to Clara Cooper and Rodney Jackson. At the young age of 8, Jas lost her father to lung cancer. This event changed her life drastically, but Jas didn’t realize this until her teens. Still grieving the lost of her father, Jas looked for love in all the wrong people. Jas met Roy Ragland in 2009. The two went on to have two boys, A’dyn in March of 2011 and Enoch in January of 2012. Jas and Roy later got married in August of 2012 and went on to purchase their first house in October of 2012. In January of 2016, Jas and Roy decided to separate because they grew apart and Jas wanted more. Jas learned how to braid hair at the age of 8 from watching her sister. At the age of 13, after asking for a cell phone, Jas’ mom bought it for her but told Jas that she had to pay the bill herself. So, Jas went to work babysitting and doing hair to pay her cell phone bill. In July 2008, Jas started cosmetology school. While in cosmetology school, Jas worked as a shampoo girl, salon assistant and stylist at three different establishments. Gigi and Jas met through a mutual friend in while Gigi was in beauty school. They later found out that they would be working at the same salon after Gigi graduated. At the salon, Jas and Gigi connected instantly; Jas is shy and Gigi is outgoing making them a great team. Eventually both Gigi and Jas left the salon where they worked. Gigi worked as a traveling stylist and used her living room as a salon, while Jas became a financial advisor. One day while Gigi was doing Jas’s hair, they decided to find a location to share. A month after coming up with the idea, they found a location. After both being denied loans, they each saved money to pay the start-up costs. From there Twist’d Textures was born! A month after opening, the landlord offered them an additional spot a few doors down from their first location. They knew it would be a gamble, but wanted to take a chance. They had a lot of ideas and knew one spot wasn’t big enough for them. Gigi wanted more privacy for her clients; she didn’t want everyone to be out in the open while getting their hair styled. 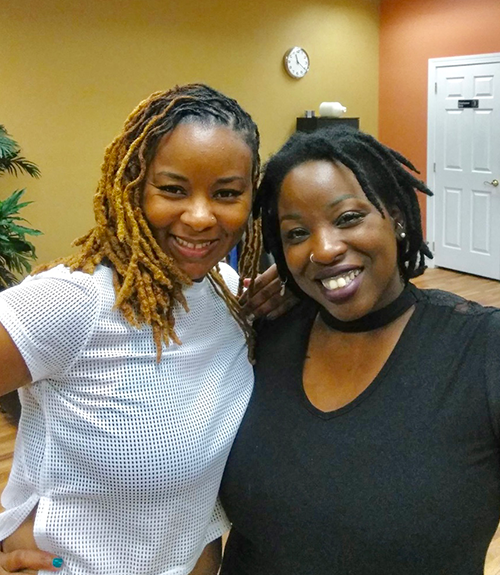 With the new location, Twist’d Textures II, was able to partner with Tailor Fit Barbers to jointly provide salon and barber services to their clients. Gigi and Jas have made a commitment to give back to their community. Every year they host a back-to-school event giving away free hairstyles and school supplies to area youth. They also help other small business owners get their businesses of the ground by providing space as well as advertising and offering services to their clients. By and large they are inspirational motivators and visionaries with a love for people and God.